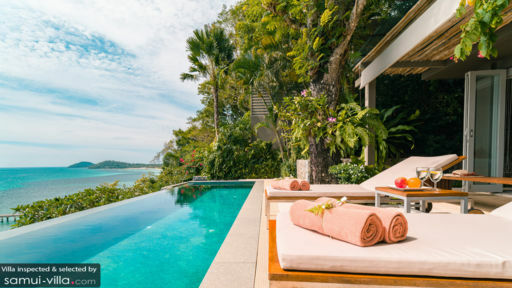 Tucked away along Samui’s sleepy southern coasts, Taling Ngam is the destination of choice for villa vacationers seeking a getaway from their getaway. Free of the bustling crowds and boisterous nightlife scene of Chaweng and Lamai, the area has everything you’d want of a peaceful beach holiday. Waking up to sparkling views from your cliff top villa is a great way to kickstart your day. In no time, you’ll soak up the quiet, relaxed ambience of your holiday home and sink easily into a state of tranquility. 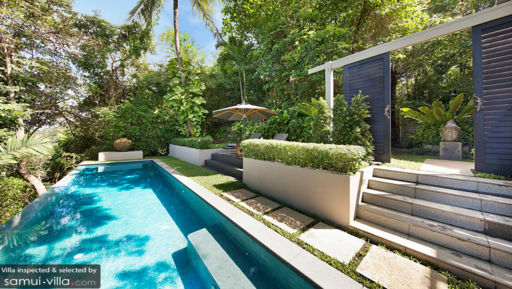 Vacation rentals of all sizes are available to meet a range of holiday needs - from cosy two bedroom villas, to majestic eight bedroom abodes made for housing an entire clan. And there’s those that were built to blow vacationers away with its variety of ultra-luxe features, like a swim-up pool bar, playground, projector screen for outdoor movie setups and direct beach access. Taling Ngam Beach offers incredible views out to Ang Thong Marine Park and calm, shallow waters. You’d be hardpressed to find beach vendors, so pack up snacks and beverages if you’re planning for a day out at the beach. If you’re looking to destress, join in a yoga or meditation class at Marga Yoga. Round up your lesson on the right note with a meal at Soul Food Cafe, where you’ll find a great menu listing out vegan, vegetarian and raw dishes. We also like unwinding with a spa ritual at the gorgeous Baan Thai Spa at InterContinental Samui, working up a sweat at Taling Ngam Muay Thai or fishing at TopCats Freshwater Fishing Resort. Sightseeing attractions are sprinkled all around the vicinity. Admire the glistening golden exterior of Laem Sor Pagoda, snap up pictures of the reclining Buddha statue of Khao Chedi, stroll through the picture-perfect grounds of Secret Buddha Garden or discover the collection of carvings and statues at Samui Cultural Center. These attractions are about 15 to 25 minutes’ drive away, and your villa manager will readily assist with transport arrangements. Taling Ngam throws out plenty of dining options. High-end venues like Jahn Restaurant and The Island View Restaurant offer an incredible seafront dining experience. Great brunches are enjoyed at Fai, Hemingway’s on the Beach and Nikki Beach Club. La Cuisine provides a refreshing change from Thai fare with its classic French dishes. Thongkrut Fisherman’s Village, about 10 minutes’ drive from your villa is home to seafood restaurants with fresh catches and uninterrupted sea views. 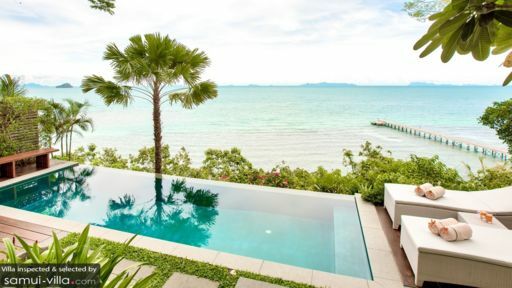 There are more ways than one to take in the sights and sounds of Samui. Hop on two wheels for a half-day or full-day bicycle tour with Samui Bicycle Tours, where you’ll ride past extensive coconut groves and rubber plantations to discover the island’s hidden finds. Or hop on a long-tail boat from Thong Krut Fisherman’s Village to explore the neighbouring islands of Koh Mudsum or Koh Tan. The former boasts a long, sandy coast ideal for long beach strolls and picnics, while the latter is a slice of paradise known for its exceptional snorkeling.